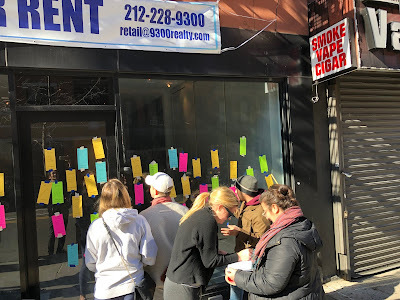 On Saturday, members of the Cooper Square Committee, FABnyc, the East Village Community Coalition and the Greenwich Village Society For Historic Preservation were out on Avenue B talking to residents about the surplus of vacant storefronts. They invited people walking by 44 Avenue B between Third Street and Fourth Street "to think about what they need in the neighborhood that could fit in the currently empty space." There are over 200 vacant storefronts in the East Village, according to a count done by EVCC over the summer and fall. On Avenue B, nearly one in five storefronts is empty. The event organizers are asking for the City Council to introduce policies and legislation that will protect, support and preserve small businesses in New York. Specifically, they are advocating for a citywide vacancy registry and penalty on landlords who deliberately warehouse space. This local action is connected to the #EndCommercialVacancy campaign, a citywide effort coordinated by United for Small Business NYC (USBNYC). Among the suggestions passersby made for businesses to fill some of these vacant spaces: a bakery selling fresh bread and a store offering affordable healthy food. I am all for encouraging and end to vacant spaces, but we really have to be realistic about the types of businesses that make sense and, more importantly, can thrive. Unfortunately, in my opinion (and I'm sure people will disagree), but I don't think things like bread stores will be able to fit the bill. All that said, the city sure as hell should pass some sort of regulation/law/tax to make it hard to sit on vacant space indefinitely. I personally like a vacancy tax that increases in cost the longer a space is vadant if the reason for the vacancy is due to a rent increase passed through by landlords. They never address the ever increasing costs of doing business or the property taxes which increase rents. Bread stores and affordable healthy food? If you want $15 wages and paid sick leave and vacations you dont get these things. I wish they would give a breakdown of the actual costs of running a business. Vacancy tax would end up in court for years. Is it legal? What would the real world results be? How about lower property taxes? I agree with Neighbor about updating tax policies for vacant spaces. We're no longer in the dire financial crisis of the 1970's, where landlords had a hard time finding tenants. It is not what store is needed in the area, the biggest problem is the high rent. Look how many stores/restaurabts came and went on 12th and 2nd ave where currently/ formerly Lumos was. They are asking 25,000 thousand a month for rent. let me fill in the blank for you: "LOWER RENT"
Yes rent increase is ONE issue with running a small business in NYC let alone the EV but the massive regulation that the city and state place on small business is untenable. It's just not worth the hassle for little to no profit with the massive exposure business owners take. Rent increase and "greedy landlords" are not the only reasons businesses cant survive. Business owners are seen as greedy and taking advantage of their employees by the majority of NYers and certainly this administration. The reality of a small business owner is they make sure to pay all their employees a fair wage and keep them happy (good workers are hard to find but that is a discussion for another day), jump through all the hoops the city sets before them,,insurance, city taxes, fines, parking, etc, and at the end of the day there is often little left for the business owner. Hell, I don't even make minimum wage for all the hours I spend in a week at my business, I don't get paid vacation days. I love my employees and customers but doing business in this city for a small business owner is not a profitable venture. That is why these store fronts are vacant. We need a real pizza shop, not a thin crust gourmet or two for a dollar slice pizza stores. We need a real supermarket, not Whole Foods or Trader Joes. We need a real chinese restaurant, not another noodle or dumpling shop. We need a recreational marijuana store - coming soon to a neighborhood near you? We need stores where the owners actually say good morning, hello and thank you for your purchase. I don't know what you're expecting. This neighborhood has some of the greatest shops in the city and is maybe the best square mile of dining in the country, yet people here will only complain. Can't appreciate a good thing while you've got it going, I guess. “Real pizza”— what does that mean? Recently we’ve had Joe and Pats and Emmy Squared open... feels like pizza is thriving in EV. Real supermarket— Key Foods and New Yorkers are not the greatest but pretty normal grocery stores. Real Chinese— lmao. Szechuan Mountain House, Han Dynasty, Mala Project, a bunch of take out places if you’re just looking for lo mein. Italian— also lmao. Posto Accanto, Porsena, Tableside, Cacio e Vino, Fiaschetteria Pistoia. Just a few that come to mind and I don’t even go out for Italian often. Gift shops— Alpahabets, Exit9, and Lancelotti are right next door to each other. 7th and 9th still have great small stores. Agree on the fish shop, I end up going to Whole Foods. For butchers Honest Chops is great; a lot of people like East Village Meat Market though it’s not my cup of tea. I agree that EV has its issues and the vacancies are a blight. Small businesses really do struggle here. But most of your examples are just silly. And what’s stopping you from getting to know your shopkeepers? Running errands last weekend and said hi to my dry cleaner, tailor, liquor store, and coffee shop. People are busy but remember a friendly face. February 12, 2019 at 1:24 PM - when you see the butcher grind your burger in front of you and cut your pork chops to order, you might enjoy your cup of tea. The Saturday crush can be hard to take but their soups and prepared foods are good too. We need a cell phone store, a TDBank, a Chase, a Bank of America, Papa Johns, Liquidteria, Sephora, Dunkin'Donuts, Milk Bar, Starbucks, Chipotle, CVS, RiteAid, Walgreens, DigInn and a giant Au Ban Pain. Don't forget a Shake Shack. Bring back Stage Restaurant. They had the best pierogies. @anon 8:37 Well said. At this point I would say rent has slipped down to about number 3 on my list of daggers through the heart. Jan 1 every supplier I have raised prices to offset the $2 jump in minimum wage and paid family leave law which requires us to take out new insurance policies. Paid sick leave should've been funded by the state not thrown onto the backs of the small biz owner. Easy for the politicians to smile for the camera and collect the votes when we are the guys footing the bill. I will not get into all the BS city fees and fines and taxes. I will say this: 7 years ago when I opened my store minimum wage was $9 per hour. It is now nearly doubled. I'm all for a living wage and most of my employees have been making $15 for years. But people need to understand that the increase cost money. As does paid sick and paid family. One employee who jumps from $13 to $15 per hour costs the biz $4,000. Times that by 20 employees and sprinkle in 5 days paid sick for each one plus a replacement worker. Again , I am all for a living wage . What I am not for is people failing to connect the dots and then bitching and complaining about why prices keep rising. We all wanted this. Now it's time to put our money where our mouths are. Oh, and fukc Amazon. Shop local. @Bagelguy. So how exactly are your workers supposed to survive in a city thats too expensive for business to operate in if you dont pay them a living wage? Many of the people who are complaining about rising prices are the same ones making minimum wage. The problem with this economy is that the top 1% have the vast majority of the wealth, and not enough is tricked down to the rest of the population to help make life more affordable. A healthy economy has workers that can afford to spend their disposable income and this helps grow busineeses and creates jobs. If there’s anything to complain about its this rigged economy, not the workers and customers getting screwed by it. @anon12am. Please re read my comment. You missed the point. @bagelguy. I didn’t miss your point, its the exact same point you always post every single time here, and its obvious you only see the workd from your own narrow point of view as a business owner. My point is that it’s also important to look at this economy from the point of view of the worker, In capitalism, labor is considered capital, but workers are not machines, or assets to be exploited, they are people. All too often, business’s owners just look at workers as an expense or a necessary evil instead of looking at them as the most essential part of an business. Machines and robots may one day replace most workers, but then who will buy your products? When you keep complaining about the minimum wage and worker benefits, you are endorsing the idea of poverty wages in one of the most expensive cities on earth, and thai is unconscionable, It’s also why we have elections, so that the politicians who you deride can protect us from business owners who will not give workers the pay and protections they deserve, If it was up to you, what would you pay your workers? And would they be able to live on those wages? I doubt it very much. Again , you miss my point completely. I’m stepping out. One , my immigrant grandparents taught me annonomity equals cowardice. Two , you’re not comprehending my comments. No one is saying let’s not pay a living wage. Again , I paid $15 and sick time long before the government told me to. You’re also speaking to someone who created 50 jobs in two tiny EV shops. I could easily go the Shake Shack or Dos Toros route and eliminate half those jobs. I don’t. My point and my only point is a living wage and paid sick cost money. Vendors costs go up. They raise prices. The shop owner in turn has no choice but to pass those cost on to the consumer or close shop. Please save the insults for Yelp or Twitter. Or better yet , remove the mask and come to my shop and we can discuss face to face like human adults. Just want to say that I always find BagelGuy to be a great commenter on this blog. He makes a great point -- too many of us expect employees to earn a good living AND customers to pay rock-bottom prices. That's just not feasible. That is the point! You can't have $15 wages and sick leave and parental leave and paid vacations and health insurance and not have higher prices! Congestion pricing is a good example. Its not just for cabs and uber and town cars. It will increase delivery costs and lead to increased prices at stores. Sky high property taxes, fees, fines, parking tickets. Its all part of it. Then people shop on Amazon and complain about empty storefronts.They complain about the prices. Welcome to reality. Its just like when open borders anti ICE sanctuary city people complain about subway crowding. These policies have real world consequences. Deal with it. At the end of the day people need to realize that if the living wage theory is going to work then we all have to pitch in. We are all in this together. Shop owner , patron , and government. The guy pouring your coffee in 2011 made $7.25 per hour. In 8 years time his salary has more than doubled. And he’s won the right to one week paid sick and paid family leave. All wonderful things. But please don’t scratch your head , make a pouty face , or pass a snide comment to the guy paying him because your coffee went up .25 cents a cup. Connect the dots and feel good about yourself for contributing to the cause. Trust me chances are the money isn’t going to fund the shop owners new Porsche. Anonymous @ 10:56 - I can only imagine you moved into the neighborhood within the last ten years or so. We used to have wonderful neighborhood restaurants and stores up and down every Avenue and side street until the greedy landlords forced them out with stupid high rent, leaving empty storefronts everywhere. Only the most pricey places survive today and barely as the EV loses its charm and clientele at the same time. I know every one of the places you mention and most of the restaurants serve mediocre food for high prices....not good value at all. Obviously you are a newbie to the city if you do not know what real pizza is or means. It is not Joe and Pat....though that is fine if you are looking for the "gourmet pie." I am talking about a walk in counter style by the slice of really good pizza with some dough on the bottom instead of a paper thin slice of whole wheat organically grown wheat.